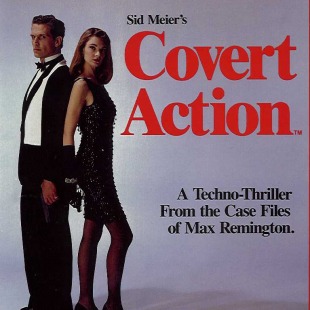 Sid Meier month continues with the spy simulation game Covert Action. 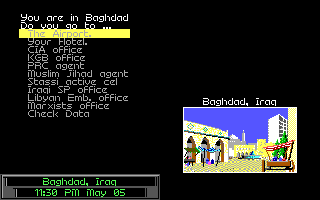 Dropping you into the shoes of a CIA field agent, Sid Meier's Covert Action (recently released at GOG for $5.99) tasks you with the tried-and-true goal of saving the free world from political groups, terrorist cells and rival spies. 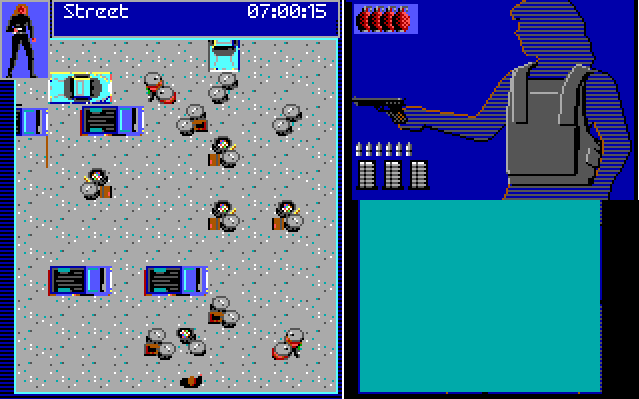 What perhaps makes it unique among spy games is the focus of its gameplay. 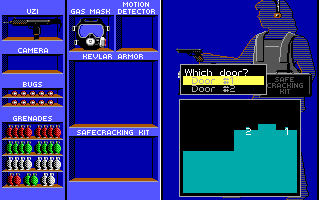 Whereas many games take the shoot-em-up GoldenEye route when dealing with spy work, Covert Action is a game firmly about investigation. Violence is an option, but at the end of the day your best bet is to stay in the shadows, collecting evidence, exposing conspirators and unraveling plots with subtlety. The meat of Covert Action lies in its investigative process, which actually requires some thought to succeed at. Mercifully, most of your toils are grounded in common sense. For instance, when one of your clues is Paris and the other is a note discussing the Marxist party, it doesn't take a genius to figure out you should head to France and look up the local communists. This isn't to say that things don't ever become more complicated. 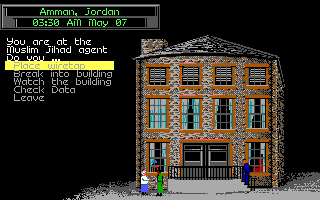 The entire push of the game, after all, is taking small clues and tidbits and using them to uncover larger plots. 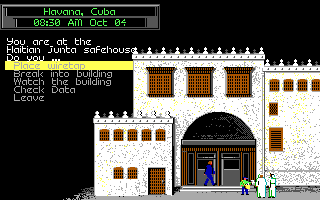 In turn, the player can expect some moments where not everything is apparent. 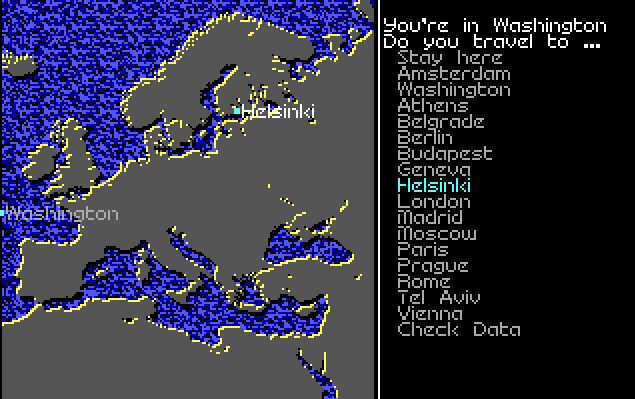 For instance, you'll frequently arrive in a city and discover that the faction you're looking for has their hideout hidden so that it's not immediately accessible to plucky spies like yourself. Uncovering their whereabouts requires a roundabout process of looking into their allies, placing wiretaps, tracing cars and even just flat out breaking into other local agencies to see what clues you can sniff out. Where the game runs into trouble is in the mechanics you'll need to use to actually acquire all of this information. 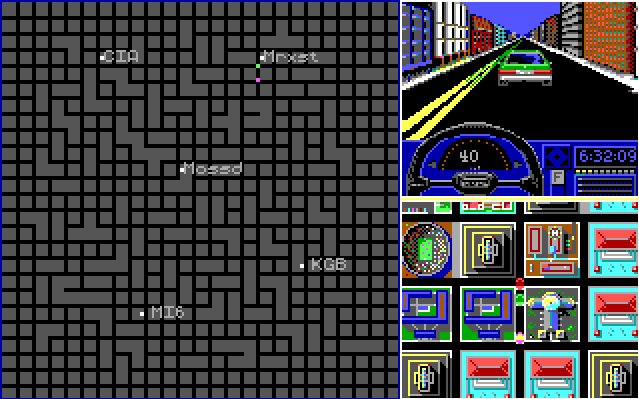 Hacking, cryptography, combat, car chases; these are the core play portions of the game and none of them are particularly fun. Hacking, for instance, is a dull connect-the-flow puzzle that you'll have to repeat whenever you want to set up a wire tap or bug a car. 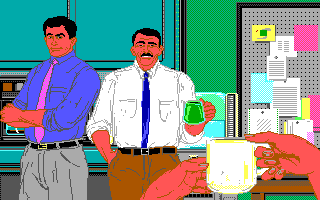 I'd also challenge you to find a more boring vehicle chase game than Covert Action's, which basically amounts to watching pixelated cars drive around a bland map with relatively minimal input from the player. The worst part for me however, was the game's infiltration and combat mechanics. Granted, part of my problems came from the fact that the movement controls were designed for the numpad of a full-fledged keyboard; something my laptop doesn't have. Instead I was forced to make do with the top row number keys, which are clearly not arranged to be convenient and intuitive movement controls. That being the case, there were still other things that bothered me about this part of the game. 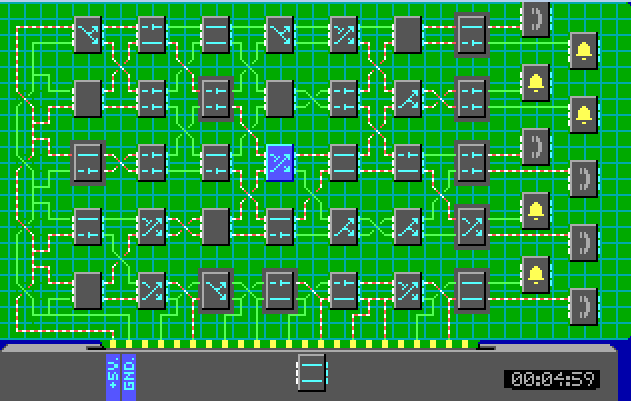 Even setting aside my less than ideal control options, movement is often stiff and unintuitive. 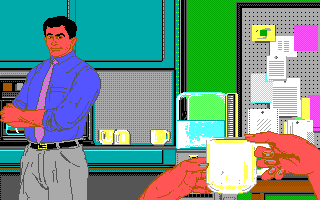 Moreover, while the game does feature a functional targeting system that's easy to use (once you know how it works), the whole thing still just tends to feel kind of clunky. Now, I can forgive some levels of clunk when the game itself provides and interesting enough experience. Covert Action, sadly, is not interesting enough, even in its better portions, for me to look past its flaws. 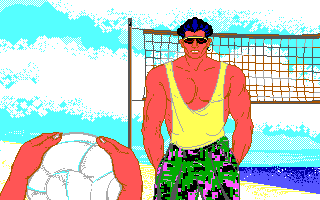 In the end, Covert Action just never quite managed to impress me the way I wanted it to. It's not that every part of it's bad. In fact, I'd love to see its concepts of thought driven investigation return in something more modern and better balanced. 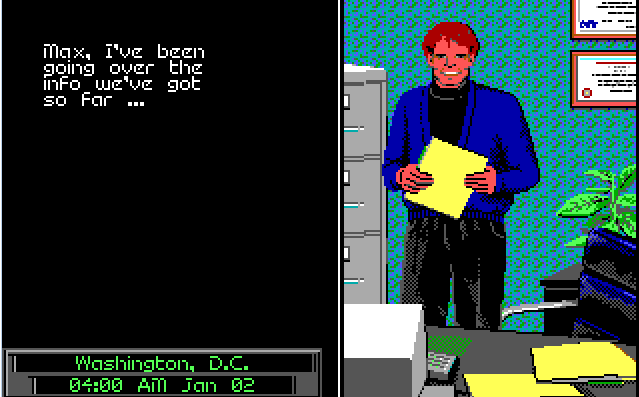 Unfortunately, Covert Action's pros never quite offset it cons. 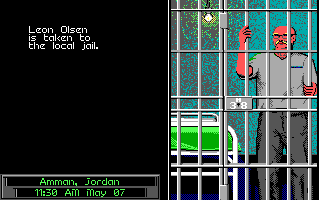 It's great when you make a breakthrough in a case, but making progress just requires you to repeat too many lackluster mechanics over and over until the game itself feels like chore. 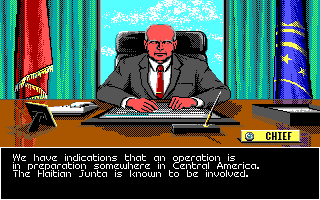 Update: When I originally played Covert Action, I did it largely without instructions due to them not being available. This led to a misunderstanding on my part involving the game's targeting system among other things. After a helpful reader explained where I'd gone astray, I rebooted the game to give it a bit more play time and readjusted my review accordingly. We'll be closing out Sid Meier month with the classic simulation Pirates!